You can catch me over at Flock Together today where I'm styling the lovely Hannah's gorgeous lavender dress. I cannot get over the Flock Together girls' dress collections sometimes. See you there! And don't forget to like my Facebook page and follow me on Twitter! Shameless self promotion! You look so pretty, love the layers! This lavender dress is such a pretty spring color! It looks great on you! I really like your outfit here, it suits you so well! That lavender and purple combo is so cute and just perfect for spring! This outfit is adorable dear, i think it has a touch of vintage! ah, that dress and the color... perfect! i love how you styled it with the collared shirt under it! 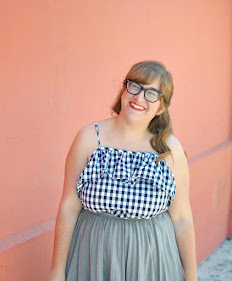 I love the feminine dress paired with the thrifted belt! It looks so great together. This is so cute! Love the collared shirt peeking out underneath, and that purple cardigan is the perfect little pop of color to complete the look. I have a similar one, in like a deep blue-purple color. We have such good taste. Lol.